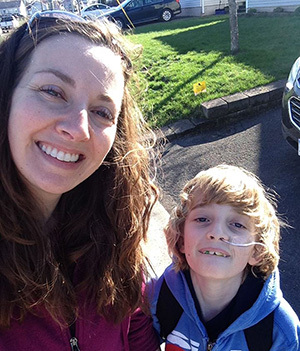 My name is Mandi Lawson and this is my son Asher who, just days shy of his 10th birthday, finally learned the name of the ailment that had been plaguing him for months – Crohn’s disease. Crohn’s disease effected all aspects of Asher’s life at school, home, and in the community. Crohn’s disease caused him to lose weight, be in daily pain, and to make too many washroom trips to even possibly count. Crohn’s disease changed his personality, his mood, his relationships. Crohn’s disease even came to Disney World with us. But one thing Crohn’s disease did not take away was Asher’s spirit. A few short weeks after Asher had his NG feeding tube in as a treatment for his disease, he jumped into his cousins pool fully clothed on a freezing cold May day just because he could. I will never forget the smile on his face that day he told me “it will be ok”. Every day since his diagnosis, I have told Asher “we have Crohn’s disease and we have a life, and these two things will need to come together”. We have lived every day since then with that mission in mind. This is why we participate and support the Crohn’s and Colitis Gutsy Walk; to remember that we can have a happy and fulfilled life even with Crohn’s disease, and to maybe even one day have a happy and fulfilled life with a cure.